This project is name D.P Rice Farming Revolution (DPRFR). It is originated in Laos and its primary beneficiaries are Lao farmers. Nonetheless, it is designed for humanity and could be replicated in every region of the world particularly in area where people eat rice and rice farmers grow their rice crops in water as South East Asia, South Asia and East Asia. Its ultimate goal is to obtain leading role in sufficiently feeding the world beyond 2050 (FWB2050). As name suggested, it is engineered for revolution in rice farming practices and improve environment. It sounds much ambitious and radical because it is drawn from urgency in human needs and nature demands. However, we believe that it could well become the very best possible answer on how to feed the world after 2050 and save the only planet we own. Primary objective of the project is to improve income of rice farmers in Laos 20.00 folds from current earning and encourage new generations to toil their rice plots. This is huge challenge because the rice farming has failed farmers very badly even nobody wants to toil his/her land but leave it unproductive and overgrown. Yet, nobody wants to toil the land because average earning from rice farming/hectare/year is only between US$400.00 and US$600.00! The situation causes large scale labor migration from rural villages and farming communities to sell labors in towns and cities. Many of them cross border in to Thailand and some never return. Subsequently, rural villages today are only home to the very old and very young because working age population has left. Sadly; when they leave, they generate more problems behind because of farm labor shortage, less food availability and nobody takes care of the elderly and the young. In many cases, those left behind suffer starvation and even die. At the same time, locally farmed produces are little found in open market while imported foods increase and expensive. Yet, the imported produces are heavily contaminated by chemical agents including deadly insecticides/pesticides/herbicides because they are farmed by commercial greed in China and Vietnam. The rural problems are indeed not confined to Laos but throughout the world especially the LDC and developing countries. If these continue, we will have no way to feed the world after 2050 when world population reaches 10,000,000,000. Field evolution: To achieve this, traditional water retaining trenches made of earth in rice field will be replaced by concrete. With the concrete trenches, water will be kept sufficiently in the field. With water sufficiency, rice farmers can farm not only rice but also anything possible in the same water with the rice farming including prawn, fish, frog etc. Alternatively, they can grow lotus roots, taro and water born vegetables commercially. Yet, the concrete trenches will last forever with little or no maintenance cost. Irrigation sufficiency: Today, irrigation systems in Laos are mostly unemployed and wasted especially those apply water pumps energized by power grid because farmers cannot pay for electricity bills. We will make it much cheaper and affordable by poor farmers through water pumps energized by solar panel. We have technology to handle this and the technology has been mobilized. 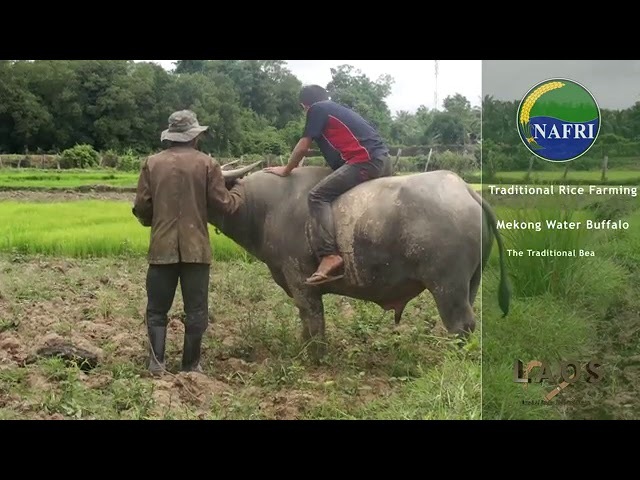 Integrated rice farming: When water is sufficiently available in rice plots, farmers can conduct rice farming and aquaculture in the very same water inside rice plots. From our experiment, a square meter of rice plot yield 0.60 kg of fish or 6,000 kg/hectares/harvest circle. Farmers could sell the fish for $US2.00/kg or $US12,000.00/hectare/harvest circle. The farmers could achieve 3 harvest circles/year with the water sufficiency. On the other hand, rice yield also improves from 3 tons/hectare/harvest circle with the earth trenches to between 4 and 5 tons with the concrete one because of water sufficiency and fertilizer from aquaculture. Eco-agriculture in rice field: We do not need chemical fertilizers because fish dung is the best fertilizer for the rice crops. Nonetheless, insecticide is needed and we obtain it from artificial charcoal processing. The charcoal is made for heating and cooking using paddy husk as raw material (see CFALD – another proposal submitted separately). At the same time, we need dung and manure for soil improvement. We will obtain this through livestock farming using paddy hay and rice bran as feeds. We have experience and expertise to handle these. Contract Farming Agreement (CFA), processing, labeling and value add: We will implement CFA to guarantee sales for all produces made by farmers at fair price. This will generate incentives financially to farmers and huge volume of inputs to processing plants. In the plants, paddy will be extracted for rice grain. The rice grain will be partly allocated for labeling and sales while the remaining processed for noodle and vermicelli. By-products as paddy husk will be used for cooking fuel production and rice bran for animal feeds. We have experience and expertise on handling these. Supply chain: This will be conducted principally through our qualified SME networks. They are free to run their businesses under our guideline. We have begun this and could well become big operation in future. International trades and exports: These are potential for growth, scaling and sustainability of the project because it leads us to wealthy markets and generates much larger income. Our priority is to utilize AEC Agreement to sell our products in ASEAN countries. At the same time, we will find ways to sell our products in the Middle East including the UAE, Kuwait etc. because these countries have money but could not produce enough food on their own soil. In addition, we will export our products to China – our neighboring country and the biggest consumer market in the world. Moreover, we will access to North American and European markets through SME owned by Lao origin in the regions. So far, nobody in Laos has done these and we will. It is our big challenge and opportunity. Fortunately, we have capability on doing these. Farmer credit union and financial services: So far, no financial institution has sufficiently funded agriculture and livestock in Laos because it is deemed high risk. We will fill the gap and oil the industry so that the farmers could fund their activities and invest their savings. Farmer organization: The government has already set up farmer organizations and farmer production networks but only on papers. We will reform and mobilize them for rural benefits through funding and hand on practices. They in return will mobilize farmers in production and represent farmers’ interests under our guideline. Farmer modernization and technology application: Farmers will be trained and agriculture machines will be used in practices. With the above; we believe that food shortage in Laos as well as many parts of the world will be overcome, rural poverty minimized, labor migration halted and environment improves. Most importantly, this project could be part of solution in feeding the world beyond 2050 and save the only planet we have owned. Therefore, it should be funded and fully implemented.